Fans of odd, forgotten, and so-bad-its-good films run a serious risk. Sometimes films that sound like a can’t miss proposition prove to be forgotten for very good reasons. 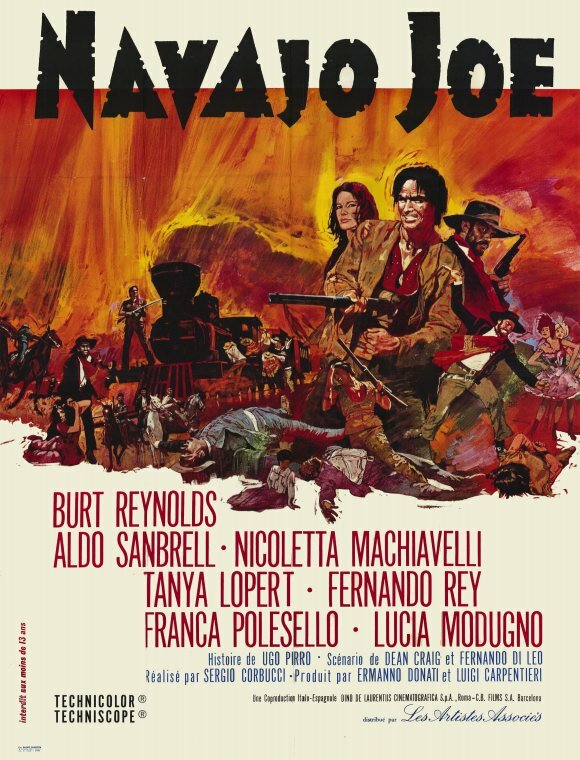 Navajo Joe, a Spaghetti Western directed by the leftist Italian genre director Sergio Corbucci (Companeros) and starring Burt Reynolds (White Lightning) as a Navajo sounds like it could either be a hilarious train wreck or some completely off-the-wall fun. The soundtrack by the legendary Ennio Morricone (The Big Gundown) was extensively sampled by Quentin Tarantino for Kill Bill. Unfortunately, that soundtrack is the high point of the film, which is mostly just very, very dull. The Duncan Brothers (Aldro Sambrell, A Bullet for the General and Lucio Rosato, The Barbarian Brothers) are bandits who kill American Indians for the bounties on their scalps, and whites for their money. Joe is a Navajo who tracks them, seeking revenge for their murder of his woman. When a townsman is overheard making plans with the gang to rob a train, the town knows the Duncan game is coming to their town to destroy it. They are a peaceful town that has no guns, but eventually they hire Joe to take on the gang by himself. Unfortunately for the town,he has no loyalty to them, so he (mostly) leaves them to the gang’s mercy while he picks them off, leading them out to the destroyed village of his people for a final confrontation. Navajo Joe is more a sleeping potion than a narrative film. The film begins in media res and never gathers any steam to its story of crosses and double crosses. Joe is more of a supporting character than a lead, and Reynolds gives an uncharacteristically charisma free performance in a ludicrous wig. Apparently he and Corbucci did not get along, and producer Dino De Laurentiis (Orca) wanted a Fistful of Dollars story, which doesn’t really fit with the characters or the situation. Joe is less the “mysterious stranger who intervenes for reasons of his own” than a man who sets the town up to fail, but the idea isn’t fully developed. Indeed, while watching this one can only wonder if Clint Eastwood had it in mind when he made High Plains Drifter, which goes fully with this idea. The supporting cast is uncharacteristically weak for a Spaghetti Western, with bland characters (the possible exception is a banjo player who uses his banjo as a bow when necessary) and a low craziness quotient and energy. Action scenes with large casts and great scenery should not be dull. Navajo Joe is only of interest to advanced Spaghetti Western or Reynolds scholars. This entry was posted in Full Reviews, Reviews, So-Bad-It's-Bad, Spaghetti Western, Western and tagged bank robbery, Burt Reynolds, cash-in, crucifixtion, Dino De Laurentiis, Ennio Morricone, Fernando Rey, Sergio Corbucci, torture, train robbery.